Peoples since the beginning of time have been revising their history. When a person in favor with the king lost his status or went rogue, his name was never spoken again. If his likeness or name was carved into the walls, the walls were destroyed or erased. Officially, he never existed. A number of books have been written that include this topic of revisionism or denialism, with 1984 by George Orwell being among the most famous. Fahrenheit 451 by Ray Bradbury is another great book that is ironically about the banning of books. It was itself a banned book for many years and may still be in certain places of the world. Sadly, we as Witnesses find ourselves in this position, and there are many books we are banned from looking at or reading by our leadership. If we are seen or caught possessing them, a judicial inquiry will begin, and a possible heresy trial will ensue. There are more of these examples, but the point is this: Revising history is not going to hide the truth. Trying to erase a person from memory or destroy their credibility is not right. Who would do these things and still claim to be God’s mouthpiece? Why would we think that they are God’s spokesmen when they do so? JJ thanks for the article. Just a quick question, what tool did you use to publish your diagram. I am looking for something similar so that I can lay out diagrammatically my understanding of the Parousia amongst other topics. The WT does not note these changes because they don’t want to look like fools. This just points out the fact that the GB/JWorg is sneaky. Remember when the number of those that partook of the Lords Evening Meal was going down? It got down to around 8000 and they never failed to point that out at every celebration. For the last several years the number has been increasing and they don’t even mention it. Are these not the real fruit that Jesus taught us to produce? Those who are in a covenant relationship with Christ? They are not even proud of this number at all. Try to figure that one out. It makes no sense! they are trying to keep face – they are not interested in truth but rather in promoting their own selves as being the only authority. It’s funny but I remember way back when I read the proclaimers book it just didn’t have the ring of the whole truth. In the bible we see serious sin and weaknesses even on the part of God’s servants like Noah, Moses, Aaron, Miriam, David, Solomon, Hezekiah, Josiah, Peter, the apostles etc. etc. The proclaimers book makes it sound that even when God’s modern servants were wrong it was only because they were awake spiritually. When they were wrong it was for the edification of the brotherhood. Even back then I remember it just didn’t sound like the whole truth. “Millions Now Living MAY Never die”. It seems to me that there is a difference between the words “Will” and “May”. I believe this was deliberately changed, yet my wife feels this was an oversight. I know and you know that these articles are scrupulously examined before they go to print. As far as I’m concerned, this was no accident. 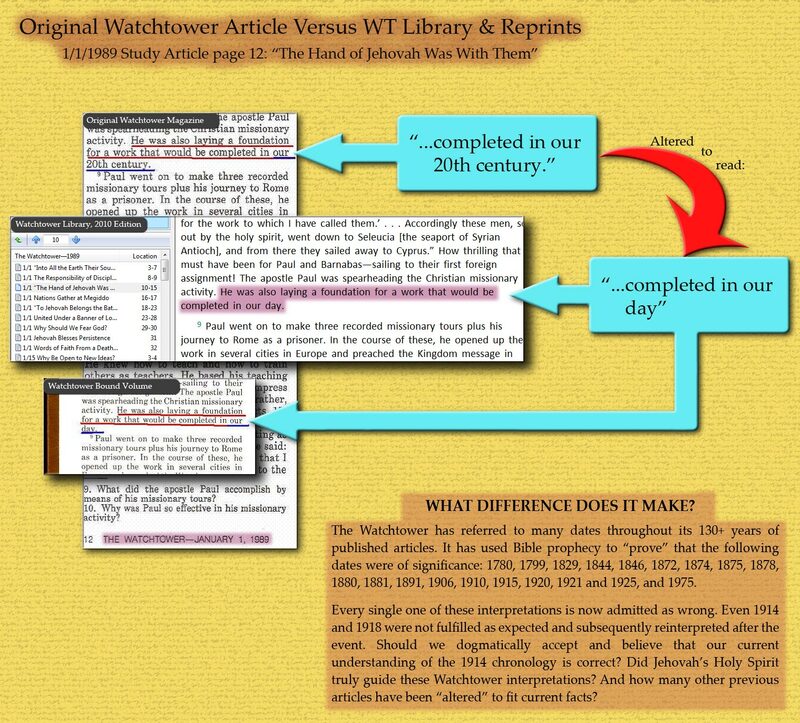 Does anyone have a photo or scan of that 2/15/2010 Watchtower, page 16 paragraph 8? Maybe a pdf file? I know it was in pdf on the Watchtowers site but it’s not now. And a close up of one of the old pictures to the right in the article that clearly says “will”. Unfortunately, this is not the best example of WT revisionism, because originally Rutherford said “Millions Now Living MAY Never Die”. It took off so well that shortly after the ad campaign began he changed it to the familiar, “Millions Now Living WILL Never Die”. Just keeping us honest. It still is a dubious alteration, but not a smoking gun folks. I appreciate your example Mark. I imagine there are many, many more. Thanks for the clarification JJ. Sorry folks! JJ can you give me verification of your comment, (originally Rutherford said “Millions Now Living MAY Never Die”)? I have never heard that before. Also, when the article I quoted first came out, I was all over it and never knew someone had posted it online. If I can see proof that I was wrong I will gladly retract my statement to my wife and show her that this was so. I don’t want to mislead anyone. Please accept my apology folks. Mark- Please don’t apologize, your reference is a good one IMO and it illustrates the fact that deception has sometimes been used in a “theocratic warfare” way by the writers and editors of the WT magazine. I was just putting a finer point on it, saying that it I didn’t think it was an example of revisionism. Your are on the money honey don’t worry be happppeee lol. JJ I would like to know what software you used to make the diagram, its pretty neat. Photoshop or Corel Draw is good for these kinds of graphics, but can be complicated. I also like lucidchart.com it’s free and pretty good too. *Assuming the view that Solomon was literally the writer of this book. Ann O’Maly, I haven’t yet understood about your quotation marks in this comment you gave us to ponder. Will you clarify whether or not these are your thoughts or someone else’s? I would like to offer a reply. I have been giving King Solomon’s words in this work thought, for a reply to you. I think I can help your understanding some here. Outstanding point. Solomon and Ray Franz’s writings can’t be read by that logic. Where Did the Nail Get Put?